2 dormitories: men's with 14 places, women's with 6 places. Bunk beds. Full details of the hut here. The hut is centrally placed for the events of the Lakes 5 Days. We have booked from Saturday 28 July (because we are helping on Sunday, so most people will want to be there on Saturday night) to Thursday 2 August inclusive (last event is on Friday, then drive home). Cost is £60 per person for six nights. Pay by bank transfer to the club account quoting reference Lakes5, and email Bob Elmes to let him know. or pay by cheque to Deeside Orienteering Club and send the cheque to Bob Elmes, 4 Erindale Crescent, Frodsham WA6 6DZ. If you want to save admin by paying the whole £60 now, please do. 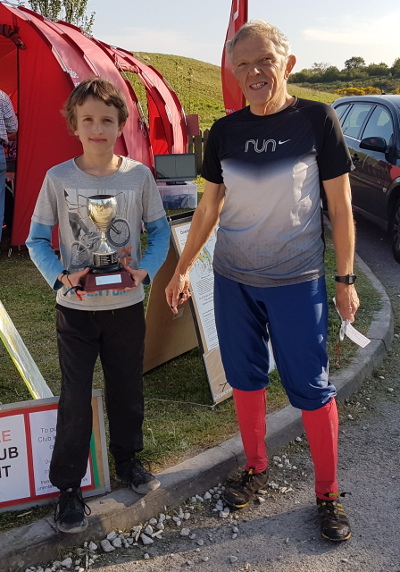 Congratulations to Sara Campbell, winner of the W50 UK Orienteering League competition. The individual competition is based on 10 best scores from the 20 events. In the team competition which is based on the best scores by 3 runners in age classes M/W16-21, 35-45, 50-55, 60+ plus 3 other highest scores from any age class, we finished 12th. Our counting runners were Connor Smith, Philip Vokes, Mike Smithard, Liz Jackson, Jon & Hannah Hateley, Duncan & Ruth Harris, Edward Halliwell, John Embrey, Lachlan Chavasse and Sara, Nick & Jane Campbell. Full UKOL results for individuals and clubs. Congratulations to all of them. Special congratulations to Johnathan, who is now British M10 Champion at Long, Middle and Sprint distances! Good luck to young DEEsiders Anna Harris and Hannah Hateley (for England) and Saskia Jones (for Wales) who have been selected to represent their countries in the Junior Home Internationals near Dolgellau this weekend. If you'd like to try a similar course to the elite juniors an enter-on-the-day regional event follows after the juniors' individual race on Saturday - see the flyer and full details. Cymru am byth! Congratulations to Anna Harris and Connor Smith who ran three legs each to finish 5th (but non-competitive) in the Peter Palmer Junior Relays at Sutton Park today. Couldn't find a sixth member of our team despite trying 8 eligible people. Few days before conversation with organiser leads eventually to "why don't you come anyway as we have spare maps". Only Anna and Connor really interested in going at this short notice. They come 5th overall (albeit non-competitive) and only 5 mins behind 3rd. Anna runs over 15km and Connor over 20km actual distance. Very well done both, and well done Duncan for getting them there. Mike Smithard has so far received 18 names offering to form part of teams for this. If you want to run but haven't yet put your name forward, please contact Mike Smithard (smithardm@btinternet.com) asap so he can propose teams and get reactions. 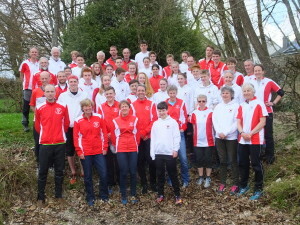 As part of their celebration of 50th anniversary of the British Orienteering Federation, Moravian Orienteering Club staged an event at Culbin where runners brought out lots of 1960s kit. Pictured here is Beryl Blackhall, formerly of this parish, sporting an original Deeside hat: note the DOC (not DEE) name. Does anyone still in DEE have one of these? 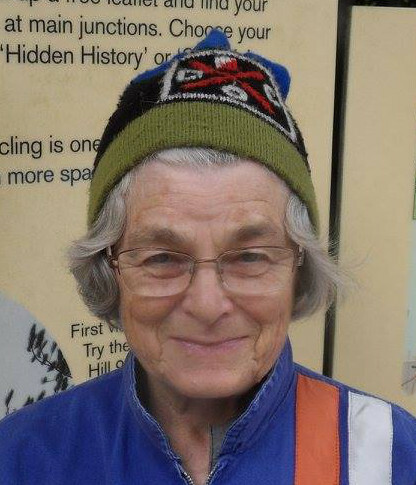 Photo by Beryl Blackhall / Moravian Orienteering Club. Congratulations to DEE runners in the NW Sprint Championships in Skelmersdale. Also a good crop of silvers and bronzes, to be updated later. British Orienteering Championships 2017 - Golds for Johnathan Bendrey and Bob Verity. 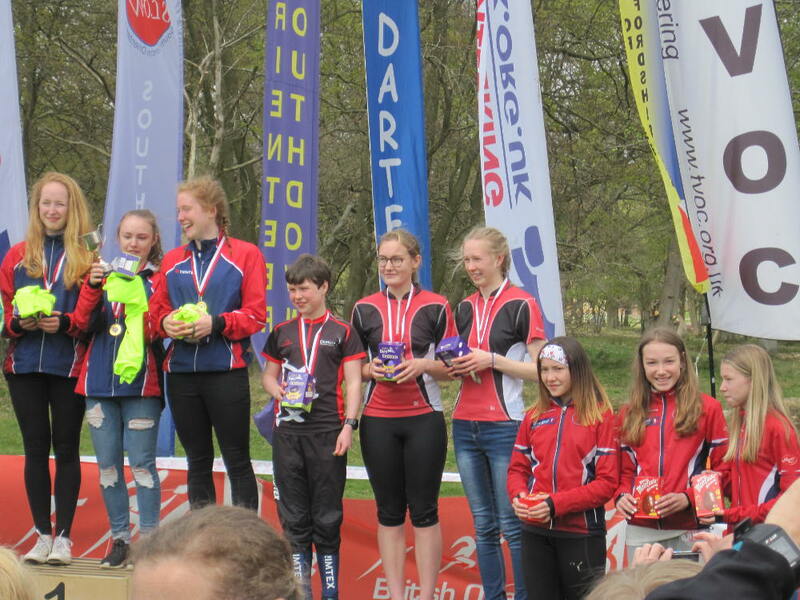 Some excellent performances by DEE runners at the British Orienteering Championships on 6 May at High Dam. Johnathan follows in Dan Weaver's and Lachlan Chavasse's footsteps by winning M10; Bob improves with age. Very well done to both of them. Belated congratulations to Anna Harris on winning W14 in her first international selection at Interland. 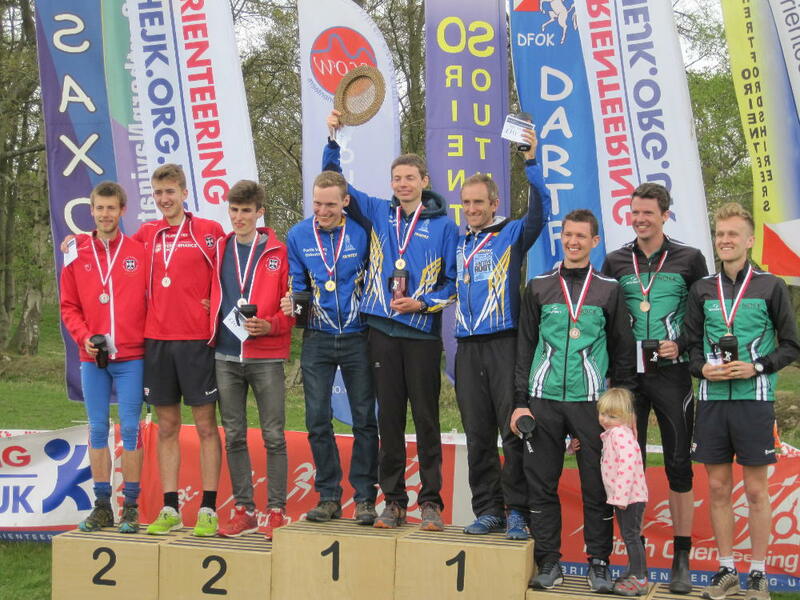 Event report and full results links on the Orienteering England website. Chris Smithard is part of a 13 person GB team in Finland at the moment in budget accommodation (a 3 bedroom house kindly lent by Finnish orienteer currently in South Wales I believe, (trip has no funding)). Yesterday saw the mixed sprint relay with Chris in the GB2 team which finished a very creditable 10th with the first team in 3rd place. Chris had the 5th fastest time on his leg and was also the fastest GB man on either leg but it was very close (all 4 within 16 seconds). Today, Chris fnished 33rd in the qualifying race with 40 to run in the final, again very close to qualify but seemed to do better this afternoon and finished 20th. Lots of top 3 splits but a few seconds here and there drops you down the list. Middle and long races this weekend here and worldofo for comment and maps. We need helpers for the British Mixed Sprint Relays at Edge Hill University on Sunday July 16th 2017. If you are able to help please let Norman Hall (norman@hall265.freeserve.co.uk) know as soon as possible. There will be a half price individual discount for helpers although this will not be available through the Fabian4 online booking; you will get a refund after the event. With short running times, double shifting won't be possible for jobs during the race but there will be jobs before or afterwards. I'm happy to collect names of those interested in running and hope that some who don't normally do sprint races will boost our numbers and enable teams to be made up. Can't promise that everyone will be able to run in their right age class but course lengths shouldn't put anyone off running up and would hope that everyone who wants to run will be able to do so. Please let Mike Smithard (smithardm@btinternet.com) know by June 15th so he can think about teams and liaise with Norman before the Closing Date. JK Relays - Podium for Deeside Juniors and Ex-Deesiders find success at last. DEE might have had a meagre 3 teams in the relays but our junior girls got on the podium with a 3rd place in the W48- relay. Anna Harris ran first, returning in 3rd place just behind 2nd, Sas Jones came back in a bunch in 8th place, just over a minute down on 4th and Hannah Hateley had the edge on most to overhaul that bunch and, with another team fading on the 3rd leg, came back in a clear 3rd place. Congratulations to them and to Anna who won so many Easter eggs during the weekend that she was giving them away by the end. Well, Chris Smithard and Dave Schorah stuck with Deeside for years after leaving uni, hoping for that elusive relay triumph but thwarted by injury and other issues so, having both settled elsewhere in the past year, they ran for Forth Valley and Nottingham in this year's JK relay and hey presto! 1st and 3rd, just like that. It helped, of course, that FVO have 2 of the top 2 or 3 orienteers in the country and Nottingham have a squad and ex-squad member to help them along. Photo shows them both in the middle of their teams, Chris in the centre holding the 'trophy' and Dave in the right hand team. Somehow, FVO forgot to bring the real trophy back but a wicker basket stood in for it. The third photo shows that elite runners check their descriptions even when running across a field to a drinks/spectator control having run about 14k in 65 minutes with another 6k to go. Congratulations to Chris Smithard who has rarely had a decent JK for some reason, but was 5th Brit in the Sprint, 5th in both the Middle and Long races to finish in 5th overall in M21E. Yvette Baker heat in West Midlands yesterday, DEE's minimalistic team of 9 plus the late addition of the Schools' Relays Primary gold medallists, Johnathan and Joshua Bendrey, smashed the multi YBT winners OD by winning 6, being 2nd in 2 and 3rd in 1 class out of 8 o record an unbeatable 896 points to 890. Whilst DEE would have qualified for the final in any event, it's great that this fantastic achievement means we have one less opponent in the final in July. Fantastic result! More strength to come from the Bendrey brothers in due course :-) (being M10 and under, they were running against non-gold standard 14's and under). Full results on the HOC website here. Mike Smithard (smithardm@btinternet.com) tel 01244 380565 has sent an email about the arrangements for the heat to all those he has remembered that wish to run. If you have not received that email but wish to run, please contact Mike asap as entries have to be in this weekend. DEE are competing in the CompassSport Cup heat near Stoke on 12 March. This is the main inter-club competition in the UK. We need lots of runners in all Age Classes, male and female. You don't have to be a top orienteer to compete and to help the club. If you are able to run, please send your name by 15 Feb to Mike Smithard (smithardm@btinternet.com) tel 01244 380565 so he can sort out start times etc and circulate proposals before the closing date. This event is pre-entry only except for the non-competitive yellow and light green courses. Mike has 26 names so far. More details in Deeside News which will be with members shortly. Congratulations to Anna Harris on her selection in the England team for the Interland competition on 2 April 2017 in Belgium. Full England team selection here. 3 events to go, including our very own NWNL at Marbury on 4 March 2017. If you've never tried night orienteering, why not give it a go? Great for developing your focus on navigation. Normal O kit plus a good headtorch. Full NWNL results tables here. From Cumbrian nightly tabloid The Moon. Masquerading as a decent, caring father this man – known to his associates only as “The Treasurer” – seized his 13-year old daughter and drove north to abandon her in a remote Lake District forest while he went off to indulge his perverted taste for “blue running”. He knew that the forest was full of dangerous adults, many of whom had such a record of deviant behaviour that they have to carry tracking devices so that their movements can be displayed on the internet as a warning to others. His final words to his daughter were “Have a good one”. She did. With only a headtorch, map and compass for defence, plucky Anna ran so fast in her attempt to defeat the lurking adults – including several elderly men who would have been better off at home with a hot water bottle and the telly – that she evaded the lot and returned safely to the car faster than any of them. The Moon says: well done Anna, and watch out Dad! Further details for fact-checkers here. © 2015 Deeside Orienteering Club.